While cleaning out our lab the other day, we discovered this mysterious piece of equipment buried deep within a cabinet. After querying several dozen scientists of different eras, we have determined only that it was manufactured in the early 20th century and no one has any idea what it is. 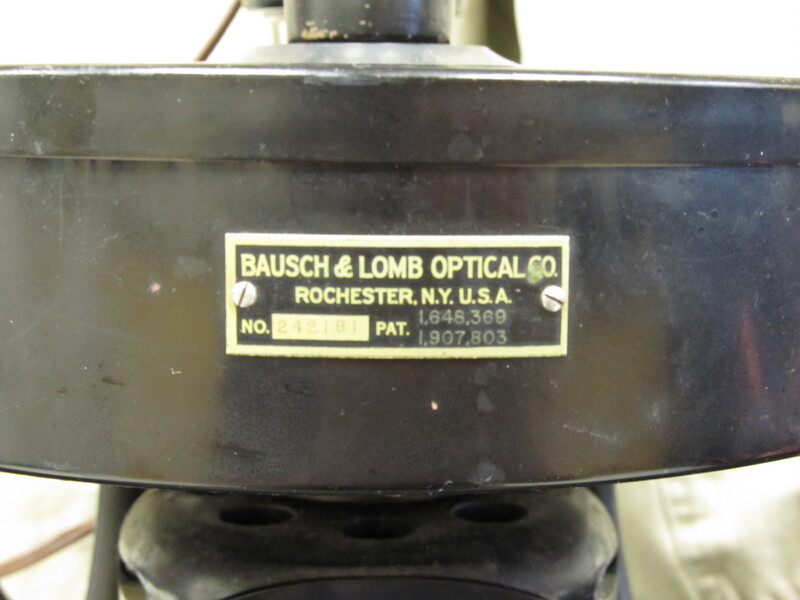 The optics were made by Bausch and Lomb, the motor was made by Dunmore. We have a few guesses about its intended purpose. This machine is massive, it weighs about 50 pounds and is forged from Bakelite and steel. The drum is clearly some kind of centrifuge and the optics point into the center of the spinning drum. No one has yet been willing to plug it in and turn it on. 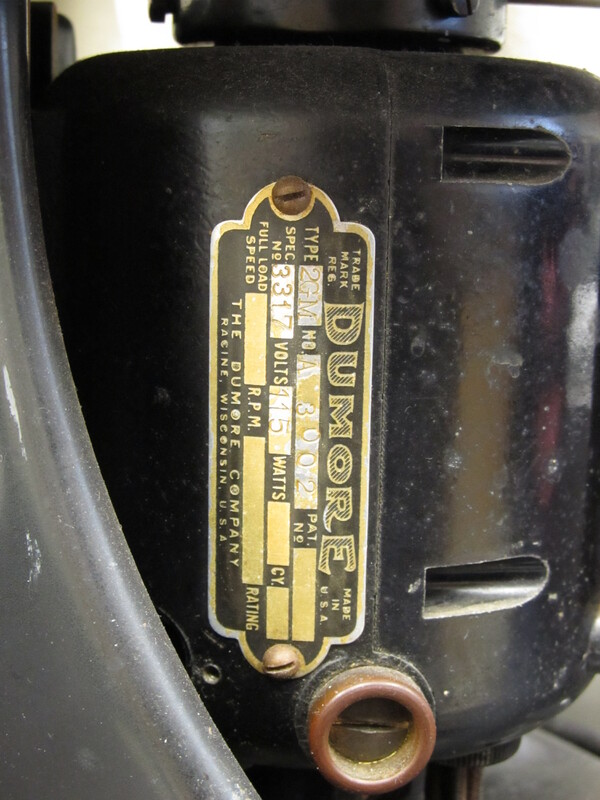 There are two patent numbers listed on the plate – patent # 1,648,369 and patent # 1,907,803. If you have any guesses or actually know what this is, please leave a comment below. Some sort of appropriate prize will be awarded to the first person to ID it or, if no one can, the most entertaining guess. Political Ecology at Home – Lessons from Abroad? According to Google Patents, it is an analytical centrifuge (http://bit.ly/ijqTUY) “capable of realizing polarized light observation” (http://bit.ly/fQrU56). What this actually, means, however, is probably buried in the patent apps. You totally have to try this thing out. Apparently it is used to observe subcellular particle movements or something? Turn it on. Do it. You could call B&L and ask them. They’re still in business, and still headquartered in Rochester. The main number is 585.338.6000. Tell the operator you want to ask them about a historic B&L product, and you’d like to talk to their corporate historian or, barring that, their PR office. In my experience, most big companies are pretty proud of their history. 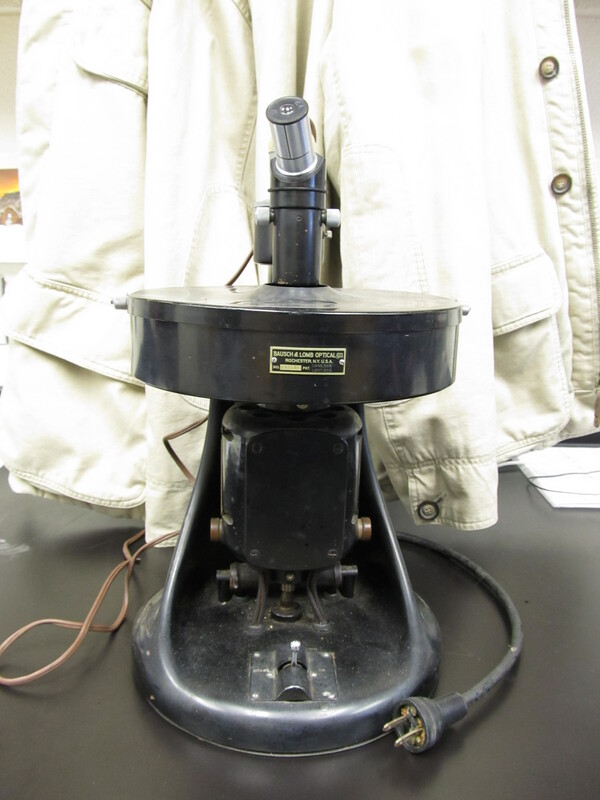 Looks like a centrifuge microscope, invented by Harvey and Loomis, as referred to here: http://tinyurl.com/4d37bzs. Clues to why it may be in your lab- investigating cell motility? I dunno- can be found here: http://tinyurl.com/4tbsmca. Apologies if you don’t have access to Elsevier. Could it be a confocal microscope? I read about this in a popular biography of Alfred Lee Loomis called “Tuxedo Park”…the analytical centrifuge invented while he was in the army. It is used to determine the stokes radius of proteins indicated by where they sediment in a sucrose gradient under centrifugal force. Certainly an analytical centrifuge and like mentioned above, it has a lot of different uses. Your colleague Bruce Nicklas would know. 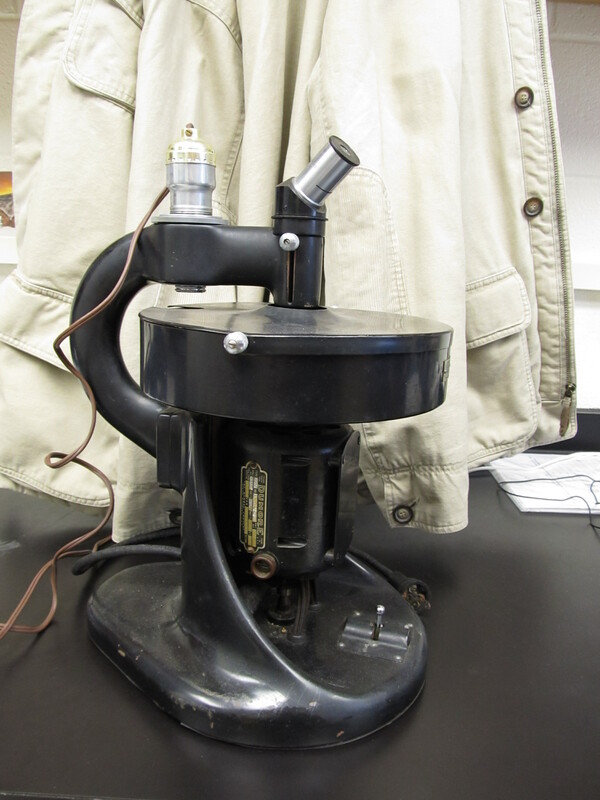 Looks like it could be a microscope-air turbine centrifuge, invented by E. Newton Harvey and Bill Loomis at Princeton around 1930. I think it may be some type of gradient purification centrifuge. Since it has a microscope attachment you probably put your material in, spin the sample down through the tubes(?) loaded with your caesium chloride or sucrose gradient solutions, when the material band is visible using the microscope, stop and remove band of material at relevant point. You don’t say what your lab does or has done in the past which could give a clue. What is inside the chamber? Could this be a polishing tool for sample preparation for further microscopic analysis? Just read the page in full, now see what the lab does. Sorry.